24.1.1906: Launched by A. Hall & Co Ltd, Aberdeen (Yd.No.419) for James Chant (32/64), Plymouth & Thomas Paddon (32/64), South Brent as ALBATROSS. 21.2.1906: Registered at Plymouth (PH17). 28.2.1906: James Chant designated managing owner. 2.4.1906: James Chant (32/64) shares mortgaged to Mary Jane Paddon, South Brent for the sum of £1000 with interest at 5% (A). 10.8.1908: Vessel mortgaged 64/64) to Lloyds Bank Ltd, London (B). 15.11.1909: When trawling 250 miles WbyS from St. Ann’s Head in collision with steam trawler St. BRIDE (M88) which was hauling, sustaining damage to bow plating. 10.10.1912: Vessel mortgaged (64/64) to Lloyds Bank Ltd, London (C). 26.12.1912: James Chant & Herbert William Chant appointed managers. 1.1.1914: Tonnage altered to 88.39 net under provision of Merchant Shipping Act 1907. 11.1914: Requisitioned for war service as a minesweeper (1-6pdr) (Ad.No.919). Based Milford Haven. 26.10.1917: Sold to Arthur Andrew & Cecil Whittaker Barratt, Fleetwood (joint owners 64/64). 27.10.1917: Vessel mortgaged (64/64) to The London City & Midland Bank Ltd, London (D). 8.11.1917: Joseph Alan Taylor, Fleetwood appointed manager. 14.9.1918: Arthur Andrew died. Shares (32/64) transferred to Cecil Whittaker Barratt (64/64). Fleetwood. By 12.3.1919: Returned and reverted to ALBATROSS (PH17). 4.11.1919: Registered at Fleetwood (FD353). 19.4.1921: Sold to Swan Trawlers Ltd (64/64), Fleetwood. 1924: Sold to Fiskeri A.B. Gamen, Säffle, Sweden (Hugo Silven, manager). 2.1924: Registered at Säffle (KD2). 1.1928: Sold to Trål A.B. Skagen, Gothenburg (Albert Billner, manager). Säffle registry closed. Registered at Gothenburg (GG83). 10.1928: Sold to Stephen Fishing Co Ltd (64/64), Aberdeen. 12.11.1928: Registered at Aberdeen as CRISABELLE STEPHEN (A374). 3.1.1933: Returned to Aberdeen with stem and bow plating damaged having been involved in a collision with an unknown vessel in dense fog. 16.1.1939: Left Aberdeen for fishing grounds in thick mist and heavy seas (Sk. F. Fraser); nine crew. At about 6.30 p.m. ran onto rocks at Scaurs of Cruden, south of Peterhead. At about 8.00 p.m. came afloat under own power. Two vessels in attendance and trawler EAST COAST (A935) connected for 14 mile tow to Aberdeen. After an hour and a half, Sk. Fraser requested that vessel be beached, but she started to settle and foundered in under three minutes. Men were seen in the water and Wemys, a fireman from the EAST COAST, jumped in to try and save the men but had to be hauled back, one man picked up but died onboard. All nine crew members were lost*. 18/01/2009: Page published. 9 updates since then. 30/06/2017: Removed FMHT watermark from image. 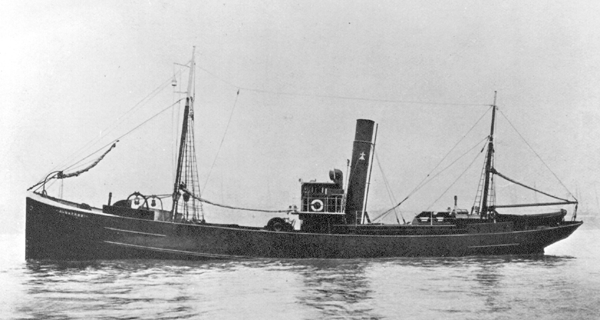 This entry was posted in Lost Vessels, Steam Trawlers, Steamers (Picture) and tagged C.W.Barratt, Lost, Swan Trawlers Ltd on January 18, 2009 by Fred Smith.